The unexpected success of Cheap Trick Live at Budokan was an interesting phenomenon to watch, as it wasn’t even released here until after it sold 30,000 copies and was already getting significant radio airplay. But while it made sense to the general public as a great introduction to Cheap Trick, it has always left me cold, and I got incredibly sick of hearing Robin Zander intone “I want YOU … to want ME!” every five minutes on the radio. Still, given that every studio album had been better than its predecessor, and they had a ton of momentum, my expectations for 1979?s Dream Police were sky-high. What a disappointment! Terribly produced and tuneless, and if you’re gonna have a nine-minute song called “Gonna Raise Hell,” maybe you should set the tempo a step above plod. But fine. After all, their next album was going to be produced by Beatles genius George Martin. What could possibly go wrong?!? As it turns out everything, and All Shook Up was so terrible that I I can’t remember a single thing about it except that I hated it so much I forgot about it until I started writing these posts. Put it this way, it made Phil Spector producing the Ramones seem like a genius move. 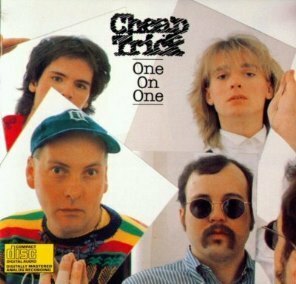 All of this is to say that, by 1982, my expectations for a new Cheap Trick album were were pretty low, which is why I was so surprised how much I liked One on One. The guitars are big, the backing vocals are glam-rock influenced, and even “new wave” experiments like “I Want Be Man” are fun and not off-putting. And then there’s “Lookin’ Out for Number One,” which is exactly as dumb as its title, but with roaring guitars and an instantly singable chorus, (with handclaps!) anchored a first side that was the best set of songs they’d written since side of Heaven Tonight. This was important, because it was one of the first times I’d written off an artist that I’d grown up with, and they made what I considered a comeback record. (Something like Some Girls doesn’t count, as I didn’t start buying Stones albums until, well, Some Girls.) What a song like “Looking Out for Number One” and all of One on One taught me is simple: you can never fully count someone out. I mean, you can, but then you might miss some of their best work. And now, after I’ve written this, I’m going to go back and seek out some of the Cheap Trick albums that have come out since the turn of the century just to make sure I haven’t missed anything.